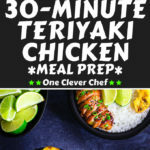 This oven-baked Teriyaki Chicken Meal Prep is super healthy and ready in 30 minutes! 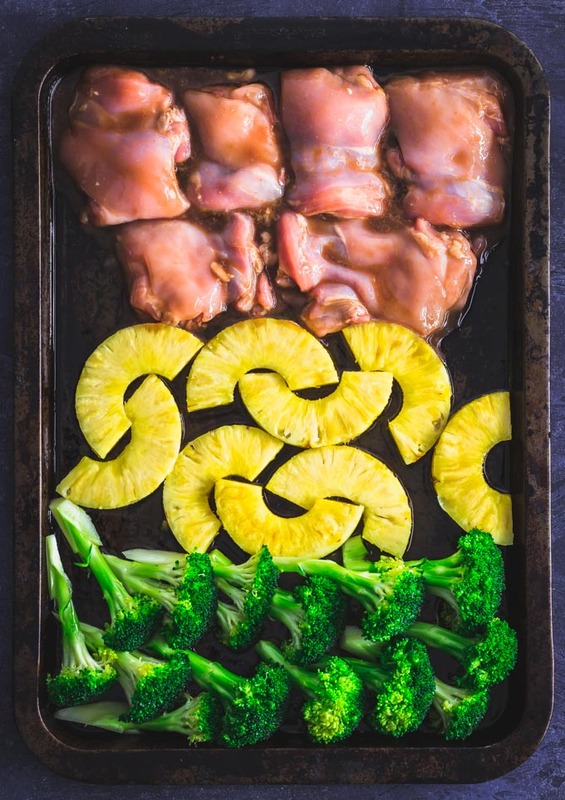 Boneless chicken thighs are coated in a homemade teriyaki sauce (which is also a marinade) and placed on a sheet pan along with some broccoli and pineapple slices for a meal that is flavorful and very easy to make. 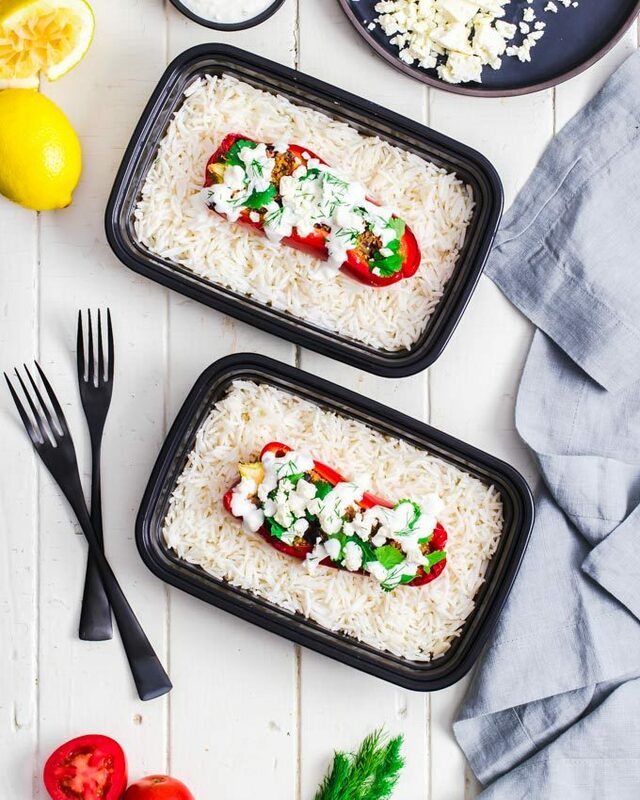 Serve on your favorite type of rice. This recipe is gluten-free, dairy-free, egg-free and nut-free. Calling all the Asian food lovers out there, I promise this one won’t disappoint! Forgot to plan dinner and you’re THAT close to grabbing your phone to order some Chinese takeaway? Please, Don’t! Take a deep breath. I have a better, much healthier idea for you. I mean, who still orders takeout in 2019 with this terrible economy anyway? And I’m not even talking about the calories! 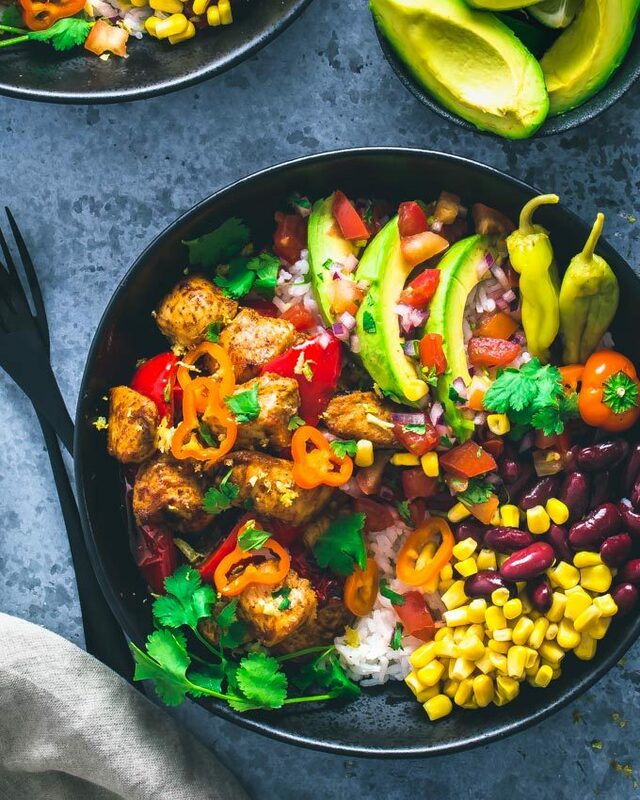 Bonus: This recipe is both perfect as a weeknight meal or an easy meal prep. Boneless skinless chicken thighs. Could be replaced with chicken breasts. Rice. Any type, but preferably Basmati or brown rice. Both have low glycemic indexes. Broccoli. Do I have to remember you how healthy this vegetable is? You could also use broccolini. Pineapple. Either canned or fresh. Tamari sauce. Could use soy sauce instead, depending on your diet. Maple syrup. Or any other sticky sweetener (like honey). Tapioca flour. To thicken the sauce. Could be replaced with cornstarch or arrowroot powder. Ginger powder. Or fresh ginger. 1. Preheat oven to 425F and line a baking sheet with parchment paper (or grease it properly). 2. Cook rice according to package instructions. Set aside to cool when ready. 3. Make the sauce. Mix tamari sauce, maple syrup, rice vinegar, tapioca flour, water, garlic powder, and ginger powder in a small saucepan and bring to a boil in a small saucepan, constantly stirring. Once it starts bubbling, turn down the heat to medium and continue stirring, until the sauce thickens (about 3-5 minutes). 4. 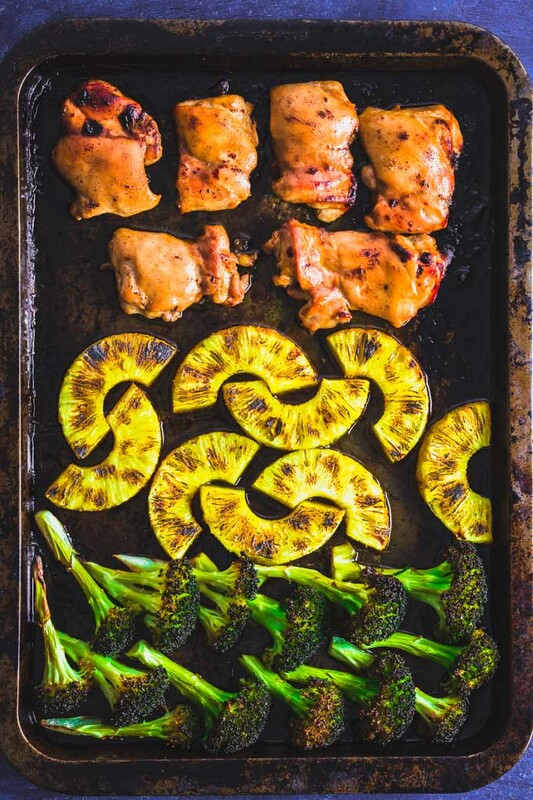 Place the chicken thighs, pineapple, and broccoli in the baking pan. Pour about 1/3 cup teriyaki sauce on the chicken thighs, then flip and turn them until well-coated. (Alternately, you could marinate them for a few hours in the sauce). 5. Transfer the pan to the oven and bake for 20-25 minutes or until the internal temperature of the chicken thighs reaches at least 165F. 6. Remove the baking pan from the oven and slice the chicken breasts. 7. 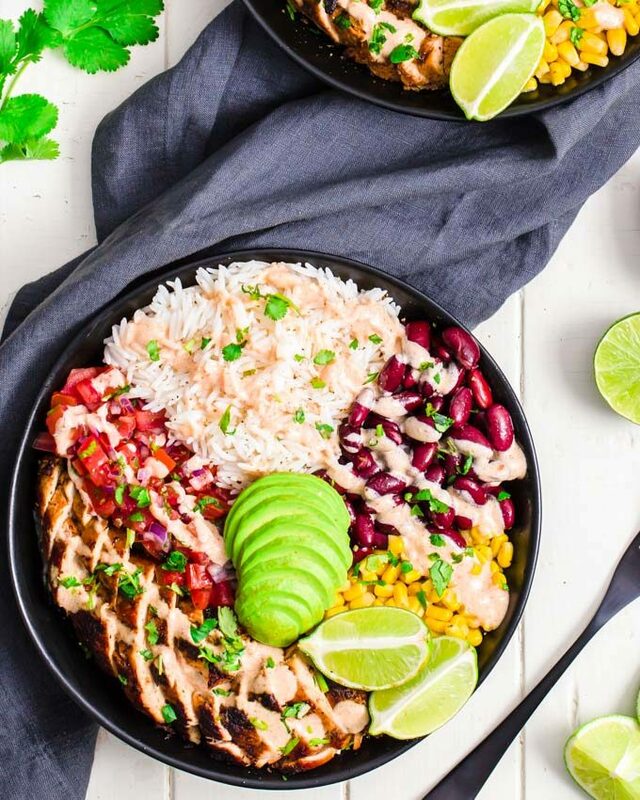 Make the bowls. Put some rice in the bowls, then place some chicken, broccoli, and pineapple slices on top. Pour some teriyaki sauce, sprinkle some sesame seeds and chopped green onion and voilà, you’re done! Yields 4 servings. Place toppings in separate containers. Ideally, place the additional sauce, green onions and sesame seeds in separate containers (they can be mixed in the same container) and wait until ready to serve to top your dish. Toppings are optional. This step is not mandatory. Reheat before eating. Much tastier this way, of course. 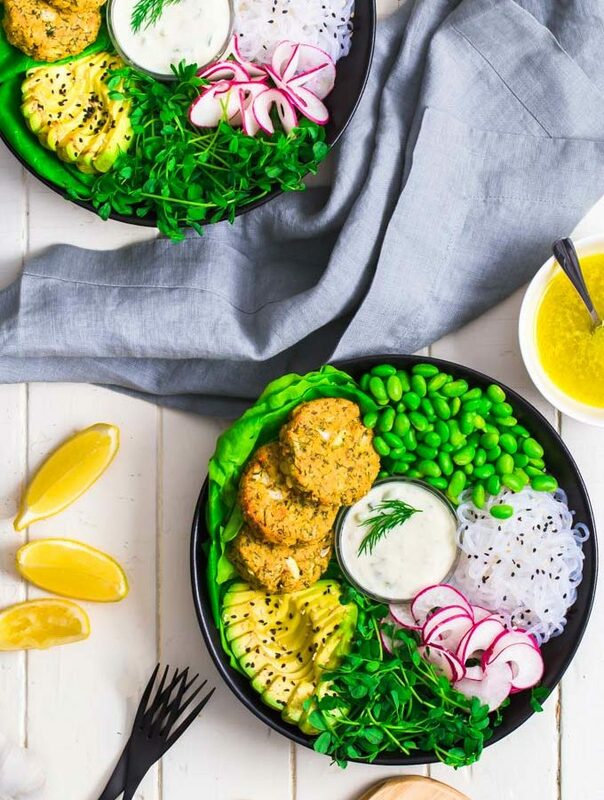 Replace pineapple with something else like edamame if you’d like. How to store. Can be kept in the refrigerator for up to a week in an airtight container. 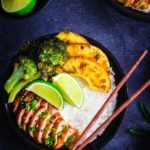 This Teriyaki Chicken Meal Prep is so tasty and easy to make, it is definitely a recipe worth repeating! Preheat oven to 425F and line a large baking sheet with parchment paper (or grease it). Cooking the rice. Bring 2 cups water to a boil in a medium saucepan. Stir in the rice and salt, cover and reduce heat to low. Simmer for 15 minutes or until all of the water is absorbed. Set aside to cool down when ready. Making the sauce/marinade. Measure 1/2 cup cold water and pour 1 1/2 tsp tapioca flour directly into the measuring cup and stir gently until well dissolved. 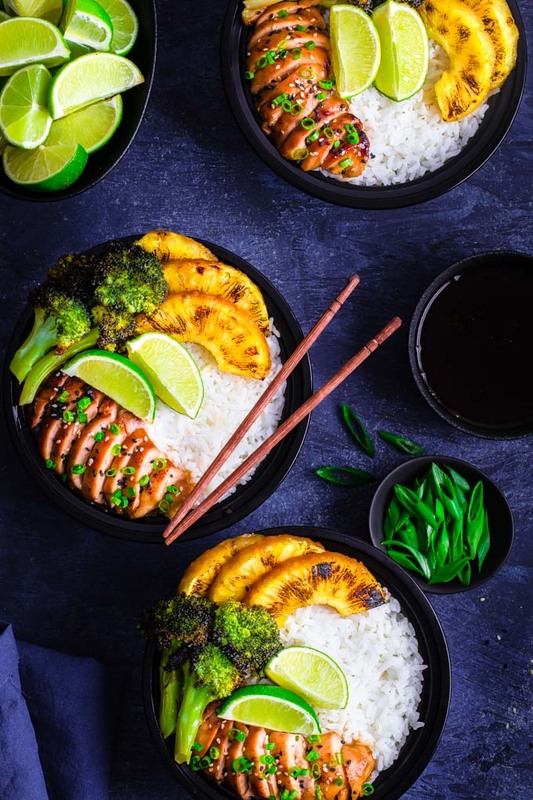 Then, pour into a small saucepan, stir in 1/3 cup tamari, 1/3 cup maple syrup, 1/4 cup rice vinegar, 1 tsp garlic powder, and 1/2 tsp ginger powder. Bring to a boil, constantly stirring, then lower the heat to medium and stir until the sauce thickens and easily coats a spoon (it takes from 3 to 5 minutes). Assembling the bowls. Remove the baking pan from the oven and slice the chicken thighs. 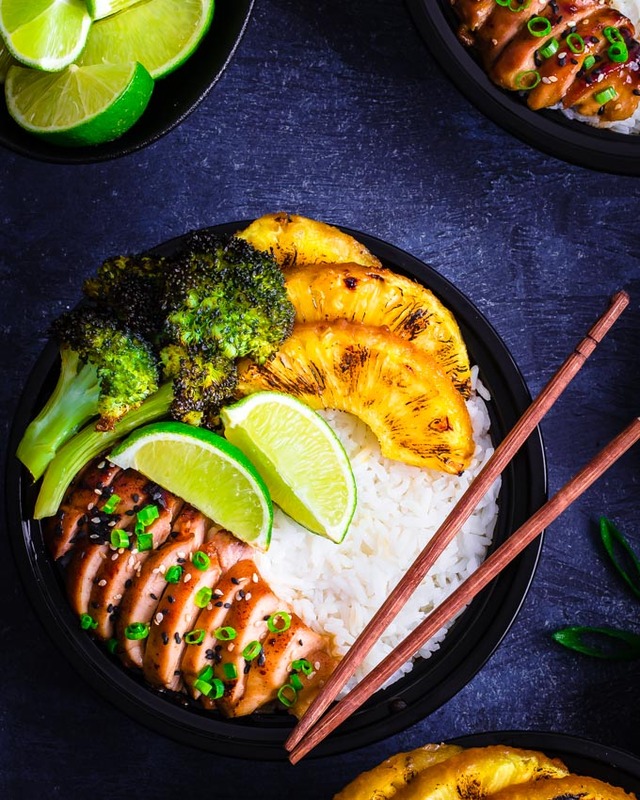 Place some rice in the bowls, then arrange some chicken, pineapple slices, and broccoli florets on top of the rice. Top with additional sauce, sesame seeds, and chopped green onion when ready to eat.